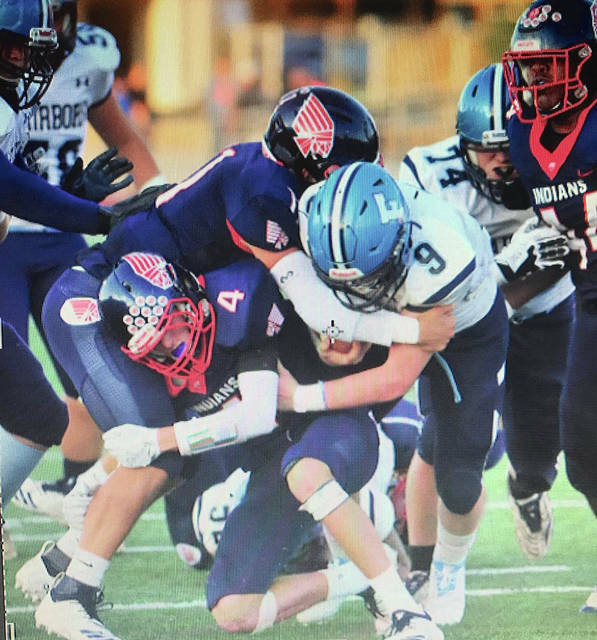 Mike Ullery/Call Photo Piqua’s Mick Karn, Blane Ouhl (4) and Lance Reaves converge on Fairborn’s Hunter Warner Friday night at Alexander Stadium/Purk Field. The Piqua football team did exactly what it was supposed to do — going 3-0 on its three-game homestand. Now, comes the big challenge for the 3-1 Indians. The Indians will travel to Trotwood-Madison Friday night — the defending D-III state champions will be be Piqua’s first road game since a 42-22 loss to Chamindae-Julienne in week one. Toopes was referring to the Indians trailing the winless Skyhawks 14-8 late in the first half, before finishing the game with 21 unanswered points. Piiqua lost three fumbles in the game and was whistled for 15 penalties. Trenton Foster provided a much needed spark late in the first half with a 79-yard kickoff return to the Fairborn 10 that set up the first of two TD runs by quarterback Mick Karn to tie the game at halftime. Two spectacular plays by Owen Toopes and Karn highlighed the second half. First, on a two-point PAT that started from the nine-yard line, Karn lobbed the ball towards the corner of the end zone and Toopes made a diving catch just inside the back line of the end zone to bring the Piqua crowd to its feet. Then, on a fourth-and-18 play from the Fairborn 29 midway through the fourth quarter, Piqua put the game away when Karn scrambled, then found a wide open Toopes near the goal line and he walked in untouched. Air Piqua: While the potent Indians running attack managed just 2.1 yards per carry and 69 yards, Karn completed 11 of 14 passes for 170 yards to six different receivers. Century Mark: Owen Toopes went over the 100-yard mark receiving, with five catches for 107 yards. No Stopping Jake: Jake Meyer drew a pass interference call, but it didn’t matter. He caught Karn’s pass anyway, a 32-yard strike to give Piqua the ball at the Fairborn 1-yard line and set up the Indians first score. Swarm To The Ball: The Piqua defense had 10 players with at least three tackles. Lance Reaves, Zane Beougher and Karn led the way with six each and Grant Toopes had five. Meet at the Quarterback: The Piqua defense had its best pass rush of the season, with Reaves, Grant Toopes and Brennan Toopes all picking up sacks. Perfect Defense: Fairborn failed on all four of its fourth down attempts. The first, when the Skyhawks were on the Piqua 17, was a fourth-and-eight, with Owen Toopes breaking up a pass. The second, a fourth-and-one near midfield, Blane Ouhl recvovered a Fairborn fumble caused by Jerell Lewis. Seeing Yellow: Piqua’s 15 penalties resulted in 120 yards, while Fairborn was penalized nine times for 79 yards. Now, the Indians look forward to the biggest challenge on the schedule thus far, before entering GWOC North play for the final five weeks. After taking care of business by winning the first three home games of the season. https://www.dailycall.com/wp-content/uploads/sites/30/2018/09/web1_IMG954482-1.jpgMike Ullery/Call Photo Piqua’s Mick Karn, Blane Ouhl (4) and Lance Reaves converge on Fairborn’s Hunter Warner Friday night at Alexander Stadium/Purk Field.